He's no George W. Bush, but will Obama's foreign policy bring us back to the days of the bipartisan, establishment consensus? Perhaps nowhere else are expectations as high for what an Obama presidency will mean as in foreign policy, where many Americans–and most of the world–are holding their breath awaiting the end of George W. Bush’s wrecking-ball approach to world affairs. In some important areas, Obama would alter or reverse course: he’d draw down forces in Iraq; open talks with adversaries such as Iran, Syria and Cuba; end torture and close Guantánamo; renounce unilateralism and preventive wars; rebuild ties with allies; and re-engage with the Kyoto climate change initiative. He’s also pledged to halt the development of and to seek a “world without nuclear weapons.” In sharp contrast to presumptive GOP nominee John McCain, Obama would start to put the threat of terrorism in its proper perspective, elevating the importance of other threats to security, from poverty to pandemic disease to global warming. “He recognizes that there are a lot of problems in the world that merit attention besides the war on terrorism,” says Danzig. Even as he pledges to end the war in Iraq, Obama promises to increase Pentagon spending, boost the size of the Army and Marines, bolster the Special Forces, expand intelligence agencies and maintain the hundreds of US military bases that dot the globe. He supports a muscular multilateralism that includes NATO expansion, and according to the Times of London, his advisers are pushing him to ask Defense Secretary Robert Gates to stay on in an Obama administration. Though he is against the idea of the United States imposing democracy abroad, Obama does propose a sweeping nation-building and democracy-promotion program, including strengthening the controversial National Endowment for Democracy and constructing a civil-military apparatus that would deploy to rescue and rebuild failed and failing states in Africa, Asia and the Middle East. Because Obama has little foreign policy track record, however (he will be leaving soon on a tour of Europe, the Middle East, Iraq and Afghanistan to burnish his résumé), it’s not easy to decipher his views, beyond his rhetoric and the people he’s chosen to advise him. Two questions arise. First, is it possible to extricate Obama’s views from those of his advisers? Many of the people surrounding him can be categorized as liberal interventionists, Clinton Administration-era veterans who believe that US military power is central to world security and who don’t shy away from the use of soft and hard power, including military force, to deal with less than immediate threats to the United States. More recently, Obama’s team has seen the addition of Democratic Party stalwarts, including former Secretary of State Madeleine Albright, former Defense Secretary William Perry and former Senator Sam Nunn, the promilitary conservative from Georgia. Progressives who are most hopeful about Obama’s foreign policy put their faith in the senator’s character and innate instincts and, as Cavanagh says, the likelihood that he “will actually listen to foreign leaders he sees.” But a team of advisers has a way of calcifying around a candidate once in office. “You find yourself surrounded by brilliant advisers who go all aflutter if you try to change things,” says Winslow Wheeler, director of the Straus Military Reform Project at the Center for Defense Information (CDI). Second, how much of what Obama is saying is simply what he believes he has to say to get elected? It’s possible that Obama’s positions on, say, the Israeli-Palestinian question are shaped by his goal of winning the votes of hard-line, pro-Israel Jews, or that his support for expanded military spending is designed to counter expected accusations by McCain that he is an appeasement-minded dilettante who hasn’t served in the armed forces. But many of Obama’s positions are meticulously detailed and go far beyond what might be needed for political expediency. And even if he is adopting these positions to avoid attacks from the right, it raises questions about his willingness to sacrifice principle for expediency. Obama’s advisers stress that he believes in the inextricable interdependence of the post-cold war world. In a campaign paper, Obama says, “Leadership in this new era begins with the recognition…[that] the security and well-being of each and every American is tied to the security and well-being of those who live beyond our borders…. It must be about recognizing the inherent equality, dignity, and worth of all people.” To fight global poverty, he pledges to double foreign aid to $50 billion a year by 2012, and to make “investments in agriculture, infrastructure, and economic growth” in developing countries. He wants to help establish a “global health infrastructure” by 2020 to combat infectious diseases, a “civilian assistance corps” and a streamlined development agency staffed with a “new cadre of development experts,” along with a $2 billion global education fund. With his Kenyan and Indonesian roots, Obama can credibly claim that he has an inherent understanding of the crushing burden that poverty, disease and lack of clean water and education place on Third World populations. And he has said that such abysmal conditions can make angry, oppressed populations susceptible to the appeal of violent extremists. But Obama may not realize how US involvement abroad, even when well-intentioned, is perceived on the receiving end as heavy-handed meddling. He and his key advisers have embraced a sweeping plan to promote democracy overseas, rebuild failed and failing states and provide aid to dissidents and democrats from Africa and the Middle East to Russia and China. He pledges to “integrate civilian and military capabilities to promote global democracy and development,” including the creation of “Mobile Development Teams (MDTs) that bring together personnel from the military, the Pentagon, the State Department and USAID, fully integrating U.S. government efforts in counter-terror, state-building, and post-conflict operations.” He would also “establish an expeditionary capability” for non-Pentagon agencies, including the departments of State, Homeland Security, Justice and Treasury. Questions also arise about Obama’s attitude toward humanitarian intervention. Several of his advisers, including Rice and Tony Lake, President Clinton’s National Security Adviser, are strong advocates of using US military force to intervene in cases of severe violations of human rights, including genocide. In 2006 Rice and Lake wrote a Washington Post op-ed demanding a unilateral US “bombing campaign or naval blockade” and even the deployment of ground forces in Sudan to halt the killing in Darfur, and Obama has called for “enforcing a no-fly zone” there. What does that say about Zimbabwe? Burma? Congo? “There is,” says Rice, “no cookie-cutter answer to the question of when a situation reaches the level of outrage that justifies intervention.” Of course, the United Nations and other international bodies may not endorse multilateral interventions in regional crises, and although Obama has not gone as far as McCain in calling for the creation of a League of Democracies to bypass the UN in such cases, his campaign is debating the idea, according to insiders. Last year Lake co-chaired the Princeton Project on National Security, whose principal recommendation was to create a Concert of Democracies not unlike McCain’s league. The strategists most closely identified with the idea are Robert Kagan, a well-known neoconservative, and Ivo Daalder, a Brookings Institution strategist and Obama adviser, who have co-written such a plan. Indeed, on the issue of the Defense Department and military spending, Obama cedes no ground to McCain. According to CDI’s Wheeler, during his years in the Senate Obama never challenged military spending bills in a significant way. In the Senate and in his presidential campaign, Obama has supported the addition of 65,000 troops to the Army and 27,000 to the Marines. He backed the latest round of NATO enlargement into Eastern Europe, and according to Denis McDonough, his top adviser on foreign policy, he supports granting Membership Action Plans for Ukraine and Georgia; the latter, especially, is considered deeply threatening by the Russian leadership and could undermine negotiations with a resurgent and increasingly self-confident Moscow on a number of critical issues, including Iran and nuclear disarmament. Obama is open to talks that would establish formal ties between NATO, Australia and New Zealand. His call for the expansion of the Special Forces would empower the most aggressively interventionist of the Pentagon’s units, and he wants to spend more money on reserve units and the National Guard. Along with his determination to pull combat units out of Iraq, Obama has pledged to beef up the US presence in Afghanistan, promising to add at least two combat brigades to the US-NATO force there. “And that’s a floor, not a ceiling,” says Rice. He’s also said that he’d attack Pakistan unilaterally to take out Al Qaeda-linked forces if there was “actionable intelligence” about their location. It’s become part of the Democratic Party catechism to accuse President Bush of letting Al Qaeda off the hook in Afghanistan and Pakistan by sending so many troops to Iraq, as if tens of thousands of soldiers were needed to hunt down bin Laden–and Obama is no exception. Yet escalating America’s role in Afghanistan, especially in light of growing tensions between Afghanistan and Pakistan, could well inflame the violence and undercut Pakistan’s ability to deal with the growing Taliban and Al Qaeda presence. Though Pentagon critics point to the overwhelming supremacy of America’s military might, McDonough suggests that, as President, Obama would spend more to prepare for future threats. “What is the long-term horizon? Will there be new [military] peers? What does China look like in twenty-five years?” he asks. Ivo Daalder, who emphasizes that he is not speaking on behalf of the campaign, adds that the United States cannot withdraw forces from Japan, South Korea or elsewhere in Asia because it would unnerve allies by giving the impression that America plans to accommodate China. “We have to reassure our allies that the United States is committed to remaining an Asian power,” he says. Obama has declared his intention to withdraw one to two combat brigades each month, starting immediately after his inauguration. But he has deliberately left vague the question of how many might remain as a “residual force,” what their missions might be and how long they might stay. Some of his Iraq advisers, such as Colin Kahl of the Center for a New American Security, a centrist think tank, are on record suggesting that a force of 60,000 to 80,000 might remain for at least several years. Others, including Lawrence Korb and Brian Katulis of the liberal Center for American Progress, have proposed withdrawing virtually all US forces as quickly as possible. Inside the campaign there is tension between advisers who want to draw a stark contrast with McCain on Iraq and those who’d prefer that Obama tack to the center and blur the differences. “What that residual force will do and how large it should be is something that he is studiously ambiguous about,” says one senior military adviser to Obama. “It might be possible, or it might not be possible, to go through this campaign without resolving that ambiguity.” At times, Obama has talked about keeping a “limited number of troops…in Iraq” to battle Al Qaeda-style terrorism, and he’s also spoken of an “over-the-horizon force,” to be stationed outside Iraq to intervene when needed. According to Kahl, who emphasizes that he is not speaking for Obama, other missions for residual troops would include force protection, such as defending the gigantic new US Embassy in Baghdad, and advising, training and equipping the Iraqi army and police. Obama’s celebrated 2002 speech, in which he called Iraq a “dumb war” and warned that it would destabilize the Middle East and fan the flames of terrorism, was a key reason antiwar Democrats rallied to his side during the primary season. But in the Senate Obama avoided engaging on behalf of the Out of Iraq Caucus in Congress, and he deliberately avoided taking a leadership role. “Obama and his staff weren’t very responsive, and on Iraq and Iran they weren’t leaders,” says Paul Kawika Martin of Peace Action. “He didn’t introduce legislation, and they weren’t the ones on the floor pushing senators, pushing [majority leader Harry] Reid.” When antiwar members of the House reached out to the Senate, Obama demurred. “In that very critical period from January to mid-April 2007, when we were trying to reduce funding for the war, he was very hard to pin down,” says a veteran House staffer. During much of that period, Obama’s key staffer was Mark Lippert, a former aide to Senator Patrick Leahy. A Wall Street Journal profile of Lippert last fall portrayed the two men as intimate friends and quoted Obama calling Lippert “one of my favorite people in the world.” According to those who’ve worked closely with Lippert, he is a conservative, cautious centrist who often pulled Obama to the right on Iraq, Iran and the Middle East and who has been a consistent advocate for increased military spending. “Even before Obama announced for the presidency, Lippert wanted Obama to be seen as tough on Iran,” says a lobbyist who’s worked the Iran issue on Capitol Hill. “He’s clearly more hawkish than the senator.” A reserve lieutenant and intelligence officer in the Navy SEALs, Lippert took leave from Obama’s staff last fall to serve a tour in Iraq, returning in June and rejoining the Obama team. Obama’s declaration that he’d meet with Iran’s leaders sets him apart from both Bush and McCain. Obama has been widely praised for insisting on a central role for diplomacy and negotiations, and for supporting the normally less than shocking idea that diplomats sometimes talk to adversaries and enemies. Asked how Obama’s policy toward the Arab-Israeli conflict would differ from McCain’s and Bush’s, one of Obama’s senior advisers on the Middle East says that “Senator Obama is committed to a much more engaged form of helping Israel and the Palestinians reach an agreement,” and that he would involve himself “at a presidential level.” In addition, the adviser says, Obama would talk to Syria, and he would support the ongoing Israel-Syria negotiations currently sponsored by Turkey’s foreign minister. But the Middle East expert wouldn’t comment on the wisdom of Bush’s stubborn refusal to talk to the late Yasir Arafat, wouldn’t criticize the White House’s endorsement of Israel’s invasion of the West Bank in 2002 and reiterated Obama’s support for the overwhelmingly disproportionate Israeli response to Hezbollah’s cross-border raid in the summer of 2006, when Israeli bombing of Lebanon killed up to 1,000 civilians. 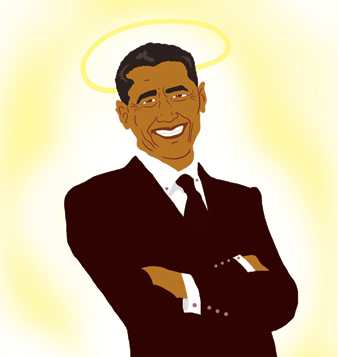 In the so-called “war on terrorism,” Obama makes it clear that he intends to capitalize on that good will. “In the first 100 days of my administration, I will travel to a major Islamic forum to deliver an address to redefine our struggle,” he said. “I will make it clear that we are not at war with Islam.” It’s hard to imagine a President McCain taking such a step. Good will is likely to play an important role in how America re-engages with the world after eight years of Bush’s reckless unilateralism. Yet more is required. It remains to be seen whether an Obama administration can articulate a coherent progressive purpose for American foreign policy in the post-Bush era. So far, at least, his team appears to be falling back on the liberal interventionist notions of the 1990s that led us into Iraq and that took life while Washington was under unipolar illusions. Young and without much experience but remarkably astute and empathetic, Obama is a work in progress on national security policy. In the crucible of a tough national election campaign, political calculations will loom large. It is thus all the more important that progressives drive their ideas into the campaign’s debates.